Got my APR GTC-200 wing a while back and finally got around to sorting it out for installation on my spare lid. First impression, Nice piece. Second impression, that can't be right!. The location point they give you to start with doesn't match what the pictures in the instructions show. There's also not enough adjustment to get the mounting plates (which don't match the lid contour at all) to line up with the edges of the lid and brackets on the wing. Hopefully they have sent me the wrong parts or they have some other solution I overlooked during the 2 hours messing with it. Miata Specific?...apparently not this one. Gonna wait until they have a chance to explain themselves before I break out the grinder and fix it myself. Any body else here install one of these? Curious as to how it 's fit for others. I don't know any specifics with the APR wing, but I have the COT wing and the mounts from FM. The NA and NB mounts are different. I'm not exactly sure the differences, but I know they are different. Maybe they sent you the wrong mount? That's what I'm hoping is the case because they clearly don't fit right. I was thinking the only difference between the NA/NB trunk lids was the high mount brake light hump on the NB, but maybe the lid width dimensions are different.. unfortunately no NA handy to measure. Where's an older miata when you need one! The FM COT mount attaches in the drain rails, so there must be some other differences. ... Where's an older miata when you need one! In my garage. The LO MSM trunk lid is out behind the shop, since it picked up a ding during the move. The widths are nearly identical. I measured at more or less the same point (just ahead of where the MSM spoiler mounts and just ahead of the R package spoiler on the '95) and the difference was about 1/16". So little of the under the skin stuff changed between NA and NB models that this didn't surprise me at all. Are the two trunk lids the same if you look at their cross section? As if you were looking at the side of the trunk from the rear quarter panel. My memory is fuzzy, but I had it in the back of my mind that this is where one of the differences are. I'm sure the contours are different, but the relative size is very similar. 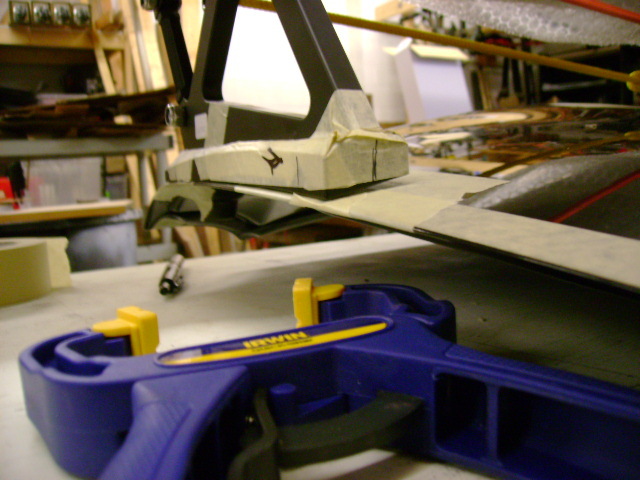 If you attach the supports to the mounting points on the wing, do they come down on the trunk lid or just outboard of the trunk lid? I'm on a COT wing but two local guys have APRs. Bob Bundy has a 'generic' one that lands outboard on the fenders. He built mounts out of aluminum angle to give it a firm mounting that still allows the trunk lid to open most of the way (he has double risers). John Mann has the miata version that mounts to the trunk lid. He used this successfully for year or two until he decided to install the optional Gurney flap. At the same angle of attack, the extra force at ~140mph folded the trunk lid into the gutters on the first session out. He bent the lid back into position and fabricated blocks to transfer the load onto the gutter which will hold anything that is thrown at it. Moral of that story - get the Gurney flap. It will significantly increase downforce with little/no increase in drag. 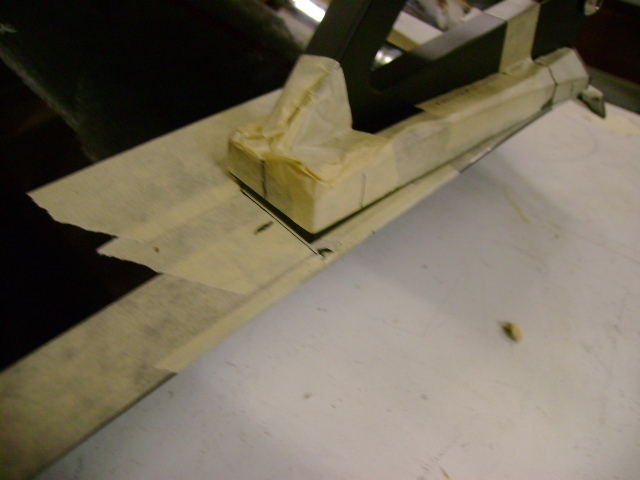 If yours land outboard, it is a better design but would require drilling into the part of the car you would rather not. If it lands inboard, it should be correct. Got pictures? Well, after some back and forth with APR today, they have confirmed that I do indeed have the "miata specific" mounts and I have confirmed that the fitment leaves a lot to be desired. Apparently it's a torque+tweak type install. The bases don't match the contour of the lid very well at all and if you follow their instructions re; placement, they end up being @3/4" to far forward, which makes the fit even worse. No wonder most of the pics I found looked the the lid was tweaked. I thought it was from the downforce but that may, or may not, only be a contributing factor. 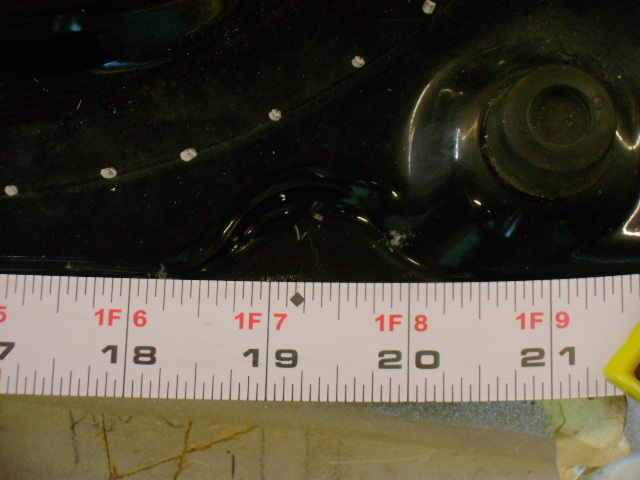 They give you a dimension of 18 1/2" for the rear stud measured back from the front point of the lid, but their pics show it landing in the stamp-out for the msm wing attaching bolt, which is actually at 19 5/16". The bases themselves rock back and forth on their opposing diagonal corners. The outer front corner is @ 1/8" too tall, and the inside rear needs a kiss more radius to get them to lay flat. Installing them as-is out of the box would definitely distort the hood in that area. Another problem is that the mounts on the wing itself are basically parallel to the centerline but the NB lid splays @ 2.5 deg, rear to front, per side from the centerline (5 deg total). So that means you need to tweak 2.5deg of splay out of each riser in the span of @ 6". If you try to mount the bases parallel to the centerline then the front stud interferes with the trunk gasket, i.e. ;trunk won't close. APR did say that their instructions were for the "old" wing being installed on an NA lid. Curious as to wether the OEM wing stamp-out is in the same place on an NB lid. See all that daylight under the front inner corner? I have masking tape to indicate where to stop grinding. The gap is actually worse than in this photo because the outer rear corner still need to come down some more. Nothing I can't handle, just thought "Miata Specific" meant I wouldn't have to. How do the fore-aft measurements to the underside stamp-outs for the spoiler holes compare between the NA/NB?I thought the contours were the same at the rear where it starts going down, just the tail light and high mount brake were different? Yeah, this has been a very strange year. I won't threadjack commiserating on '90MSM growing pains but someday, I'll get around to updating my thread. I've been lurking more and posting less but once I get through MRLS, I should have a better handle on my time. I've started working on the APR fitment issues. 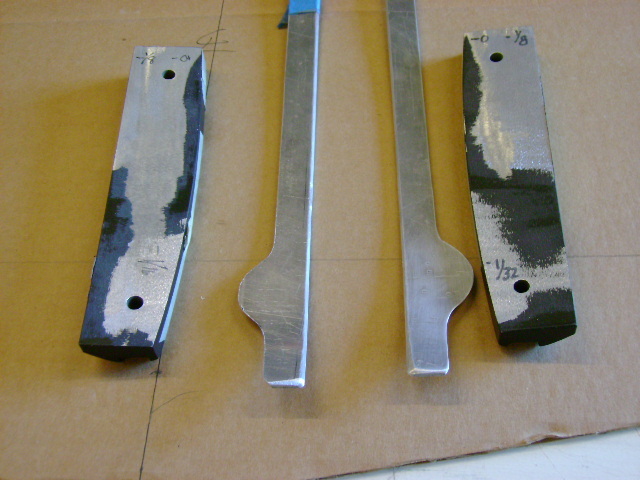 3 belts sanders/3 grits in 3 different vises saved a fair amount of time but still tedious work when grinding too far is not an option. Up first is the location of the rear hole issue. The instructions say to mark it at 18 1/2" but their pictures show it at the stamp-out. Their instruction pics are from an NA install, so if someone can send me a pic showing the dimension to the stamp-out on an NA lid, that may clear up the confusion. I'll be sending this info to a guy at APR so they can amend/alter/advise as needed for the NB installation, as they were unaware that the lids were different. Heres the stamp-out location on an NB lid. On the MSM, this is where the spoiler bolts are. 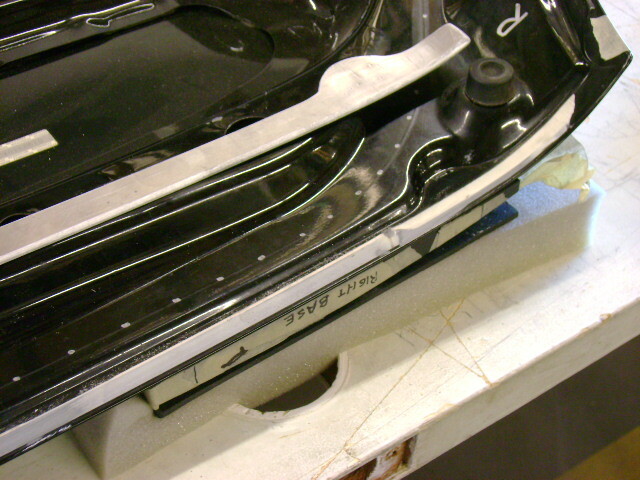 Here's the bottom of the base plates after grinding/fairing them to lay flat on the lid. 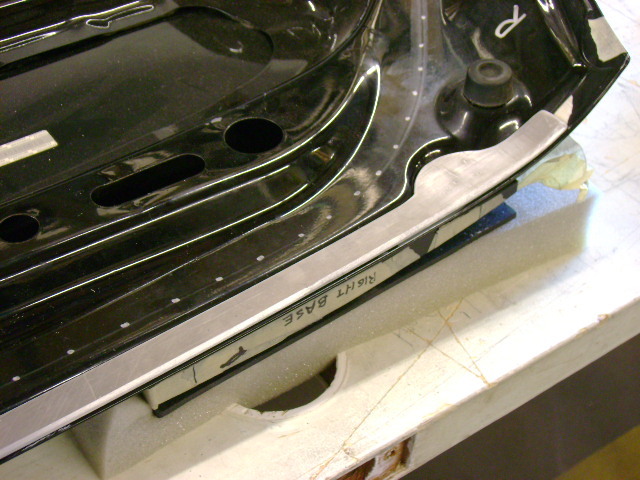 Also had to re-concave the middle section a little after taking off @1/8" on the outer front corners. 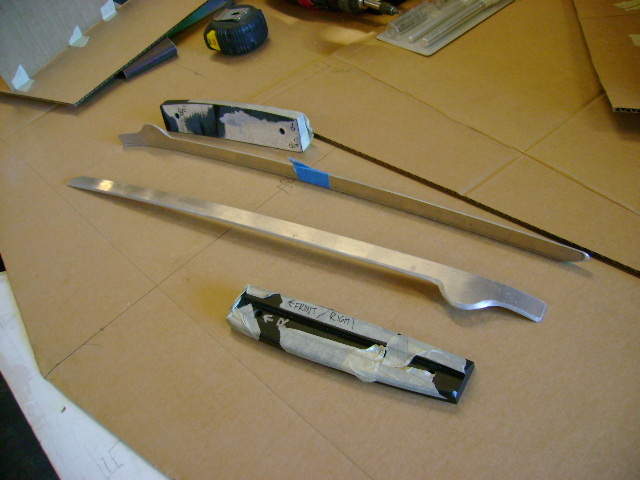 These are some lid-edge stiffeners I fabbed to try to keep the lid from getting tweaked, inspired by the John Mann incident Hyde spoke of. I'm working on some load transfer blocks that will sit in the rain gutter but still allow the water to drain. Their instruction pics are from an NA install, so if someone can send me a pic showing the dimension to the stamp-out on an NA lid, that may clear up the confusion. I'll be sending this info to a guy at APR so they can amend/alter/advise as needed for the NB installation, as they were unaware that the lids were different. I'm a bit whupped to get to this tonight but I have both trunks in the garage (the NB is even the correct color). I can try to look at it after work Monday or if you are in the north end sometime this week, I can let you know when I'll be home. Good enough. I may be going to Whidbey for some more spares this week.